It is no secret that students are often cash-strapped after spending money on food, clothing or on varsity supplies such as books and stationary. Some earn very little from part-time work as their primary concern is their studies. While some are quick to look for a food special or a clothing sale, the same consideration should be taken in when selecting a bank that works for you. Students should be using the most cost-effective student account with cool lifestyle perks and minimal bank charges to save money for more pertinent necessities. South Africa’s biggest banks all have different prices and perks for students. 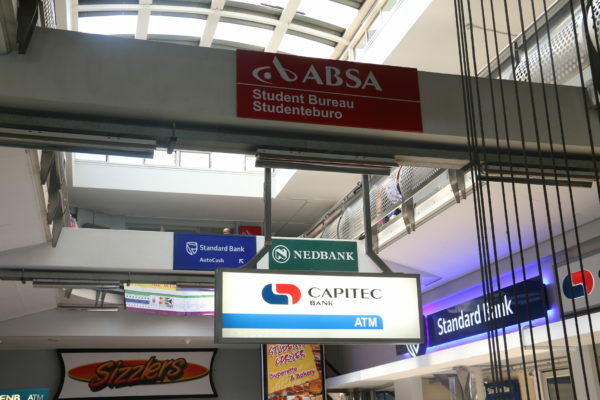 The five main banks: First National Bank (FNB), ABSA, Standard Bank, Nedbank and Capitec, are compared below for students to quickly calculate which is the cheapest option for them. Standard Bank offers the Student Achiever account which comprises of unlimited swipes at till points. Students also get two free withdrawals or deposits and eight free electronic debit transactions a month all for a monthly fee of R5,30. The catch is that if you go over the bundled transactions, a fee of R25,22 will be charged to your account. The only lifestyle perks available on this account is a free subscription to Varsity Vibe, South Africa’s first student discount application, and 50% off your TravelWallet card activation, loading and reloading. First National Bank has the FNBy (youth) account. The fixed monthly fee is R10. FNB withdrawals cost R1,90 per R100 drawn while other ATMs cost R10,90 for the same transaction. Internal transfers are free of charge, however, deposits at FNB ATMs will cost you R0.95 per R100 deposited. Christianne Jones, third-year BA general student, told Wits Vuvuzela that she uses FNB for convenience. “I use FNB because my whole family have FNB accounts, so money transfers are instant and do not charge me anything,” the 21-year-old said. ABSA’s account geared towards students is called Student Silver Account. It has a fixed monthly fee of R24,21 with no additional costs. All inquiries, deposits, swipes, withdrawals and internal transfers are free at ABSA ATMs or ABSA supported ATMs. ABSA have a few lifestyle perks which may be attractive to students, such as a food voucher to be redeemed at McDonald’s, Debonairs, Steers (online) or Nando’s. A R150 travel voucher, 30% discount on a membership at selected gyms or 100MB of free data every month is also included. The green bank, Nedbank, offers students the newly rebranded Unlocked.me student account. The fixed monthly fee is R20. Transfers, withdrawals and deposits are all free with Nedbank ATMs. However, withdrawals at other ATMs are R12,57 plus R1,51 per R100. Nedbank’s student account is the only account to rival ABSA’s lifestyle perks. Students can choose any two of the four listed perks which include 100 MB data bundle, R30 online Debonairs voucher, two for one Nu Metro tickets or a R150 TravelStart voucher. Capitec on the other hand, does not have an account specifically catered to students. Their general transitional account, Global One, can be used as a substitute. The monthly fee is R5.80 but there are additional charges for withdrawals, deposits and transfers that range from R1,61 to R8,83 per transaction. The Global One account offers access to four other savings accounts under the original monthly fee. There are no lifestyle perks with this account. Fourth-year accounting science student, Thulani Mkmkaba told Wits Vuvuzela that he uses Capitec because he believes it caters to his needs. The Matrix on East campuses houses all five banks and students can open their desired accounts at any of above listed banks.